Bird hunting season came upon us faster than usual this year. Summer guests and fishing trips filled the calendar instead of days of preparation and planning. It wasn't until the night before Aug. 10 that I fretted over what gear to take on our first day of the season. My anxiety over picking out a shirt took on significance as I stood in front of my closet. There were seasons I dressed in the morning without putting much thought into it and seasons when I laid out the entire outfit the night before as if it were a ritual. Winchester lay in the doorway of my bedroom, watching me contemplate. "Hey Bubs," I said. I held up the white shirt I'd worn the last season opener and watched for his reaction. He didn't have one. Then I held up a new shirt with the tag still on it. Again, no reaction. I went into the closet and dug around to find the old green shirt from our early years together. "What about this?" I said with enthusiasm. This time his tail wagged. Not because he thinks a shirt matters at all but because it meant something to me. My nervousness gave way to excitement as I fluffed his head and talked about the next morning. We had the important stuff right, even if some of the details weren't figured out. When it comes to gear, a combination of superstition, nostalgia, practical considerations and whim — such as letting a tail wag pick out my shirt — inform final decisions. This year, I took my Beretta 28 gauge over/under after three years of carrying the Syren Elos Venti in 20 gauge. The Syren is a landmark shotgun designed specifically for female shooters. The Beretta was the most beautiful gun I could not afford at the time but purchased anyway at a fundraising auction. It was the same year Winchester found his home with us as a puppy, in 2010. An over/under is my favorite shotgun for both upland game and waterfowl. There are many reasons to choose an over/under for bird hunting despite arguments for an autoloader, which provides more shots, less recoil and a lighter-weight option. Like a preferred hunting dog breed, a favored gun doesn't always match the recommendations of the experts. Our own experiences are more important. The first over/under built in the U.S. — the Browning Superposed shotgun — was conceived purely for the wingshooter. The design of firearms up to that point focused on military or law enforcement purposes. Unlike the autoloader, John Browning built his over/under shotgun for one purpose — wingshooting. An over/under (or double gun) may not allow for a third shot, but it provides the option of shooting two different patterns instead of the single choke option of a single barrel gun. When hunting upland birds, my bottom barrel is an improved cylinder, and my top barrel is a modified choke. Two barrels allow the most effective pattern for the first shot at a nearby bird and a second shot at a bird farther away. The shorter length of a break-open gun, due to its lack of a lengthy feeding mechanism, gives it a handling advantage. It may be personal preference and experience, but an over/under shotgun feels better balanced, both when carrying it in the field and when swinging the weight of the shorter gun. It is visually easier to determine if a break-open action is safe and unable to fire. If the gun is open, it's safe. A magazine tube-fed firearm hides the shells from view. When hunting with others, it's more enjoyable if everyone can judge safety at a distance in the field, and when I'm not using a sling, I carry my gun open for this reason. When I was new to shooting, the simplicity of an over/under appealed to me for both reliability and maintenance issues. With fewer parts, a hunter in the field does not have to worry about ejection ports, shell carriers and magazines. Care and maintenance are as simple as wiping the gun off and applying a dab of oil instead of worrying about gas pistons, forearm nuts or recoil springs. My first year hunting, I wore a bulky jacket, cotton shirt, gym socks and stiff hiking boots. No surprise I wound up cold and wet, with blisters on my feet after several stream crossings and an uphill climb left me drenched in sweat. Now I wear Merino socks, hats and base layers for their breathability and temperature-regulating ability. It's important that clothes don't restrict movement and are easy to put on and take off. Better to pack what you might need for weather changes than to be six miles into a mountain valley and wish you'd brought it. *Kent Bismuth 28-gauge, 7/8 ounce, six-shot – lead-free shotgun shells. *Eddie Bauer Skyliner hunting vest, a goose down quilted shooting vest with a game pouch. *Marmot Women's Abigal lightweight insulated vest. *Eddie Bauer women's Palouse long-sleeve shooting shirt. *Beretta wind-barrier sweater, a lined wool sweater. *Prois Archtach baffled goose down pack jacket. *First Lite women's Larkspur Merino full-length bottom. *First Lite tag cuff Merino beanie hat. *Dublin Tall River waterproof leather boots. *Garmin Alpha 100 GPS tracking collar. *Mendota whistle lanyard with compass. The choice to take the Beretta opening day this year harkened back to an earlier time with Winchester —formative years when we had both learned so much from each other. I also wore blue jeans, a poor choice, even though they were comfortable. But if my purpose in enjoying the outdoors is to get away from the noise of civilization and breathe the mountain air in the company of a good dog, a comfortable pair of blue jeans work fine. My companion Steve still wears cowboy boots into the mountains until snow is on the ground. It works for him. So often, an old lucky shirt or the gun handed down to you by your father serves you better than this year's version. I think back to days when I wore all the wrong things and borrowed lesser versions of what I didn't own. Those hard lessons made for great memories. I remember Winchester over-running birds in his youthful enthusiasm or tearing a carpal pad chasing a fallen bird — rare events these days. On opening day this year, he held a point for 20 minutes on a covey of white-tail ptarmigan too young to shoot. He never broke his point and let us flush the birds so they could go on to live another day. Most of the birds he found on this day were too young, and we only ended up taking one bird from a group of adults at the highest elevation. We'd both come a long way. At the turnaround point, we sat on a rock and looked back over the valley together. It was like those childhood moments with your best friend. Hunting represents an enduring vestige of personal freedom with few rules and no uniforms. 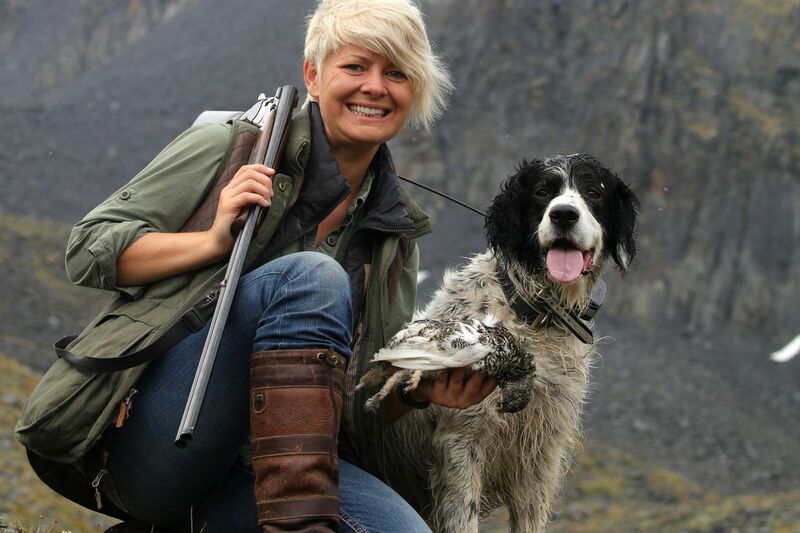 Our favorite guns, dogs and gear reflect who we are and what we pursue together.